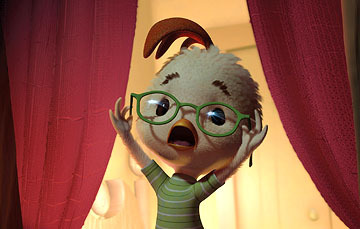 Kim Hollis: After opening to $40.0 million last weekend, Chicken Little dropped only 20% this weekend. Its $32 million total easily won the weekend, and the film now has a running total of $80.8 million. How surprised are you by this performance? David Mumpower: I wasn't surprised by the opening weekend at all. That's right in line with other non-Pixar/Shrek CGI animated performances. The second weekend holdover, on the other hand, is stunning. Chicken Little is performing like a 2001 release instead of a 2005 title. Kim Hollis: It's certainly good box office news in a year that has been grim. I expect huge drop-off next weekend. Even Monsters, Inc. fell heavily in the face of a Harry Potter film, and we've seen that sort of trending with the sequels as well. David Mumpower: With $80 million in ten days, Chicken Little appears likely to cross $135 million, possibly even $150 million. Like Madagascar, it merited disappointing reviews but managed to lure customers in anyway. That Disney marketing machine is really something. Joel Corcoran: I'm rather surprised actually. I wasn't sure that Disney could pull off a CGI animated film on its own without Pixar, but they've more than proven that they can. I never expected it to bomb, but to do this well over a couple weeks ... it's very impressive. Reagen Sulewski: That opening weekend result is something of a weak result for a Disney branded entry in CGI animation, but this second weekend is well above its potential. Also, I don't agree that Disney couldn't do CGI without Pixar. CGI isn't a genre, although it sometimes behaves like one. What Pixar has done is craft clever stories and characters. Joel Corcoran: Oh, I know - I wasn't talking strictly about the technology. I think Pixar defined the CGI genre, not just for the technology, but for the reasons you described, Reagen.